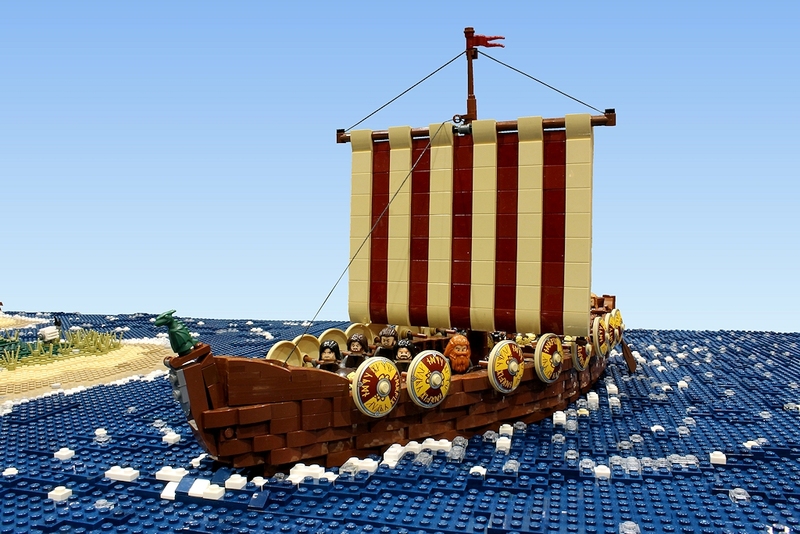 The year 793 is arguably one of the most important years in British history, for this is the year of the first recorded Viking raid on these lands. Of course we can’t discount the likelihood that earlier raids took place and nobody bothered to write about them; but at the very least, this is the year in which people really started to take notice. Our story is told through the sinuous waters of a tidal river, which weaves its way past Anglo-Saxon villages, riparian woodlands and estuarine bogs to the island dotted shores of the North Sea. 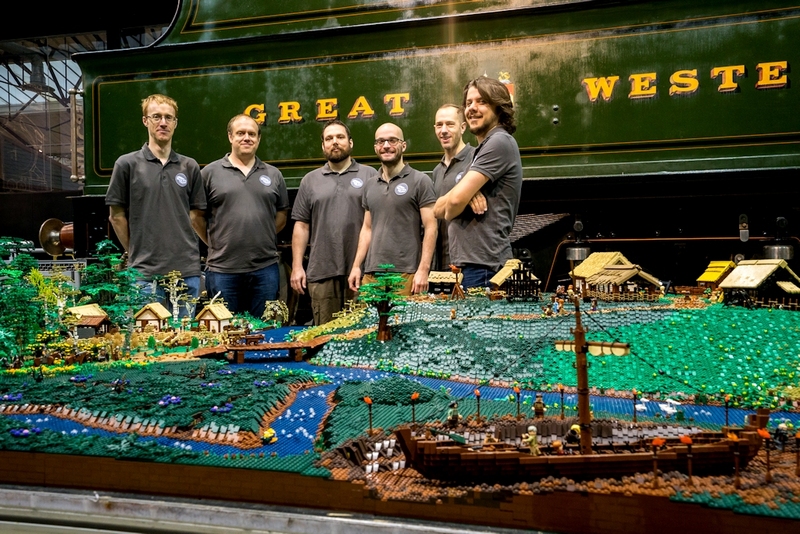 The model was created in 2016 by builders James Pegrum, Dan Harris, Simon Pickard, Jimmy Clinch, Steve Snasdell and Tim Goddard. This was Tim’s first year building for Brick to the Past, although he had many years of experience before joining us. 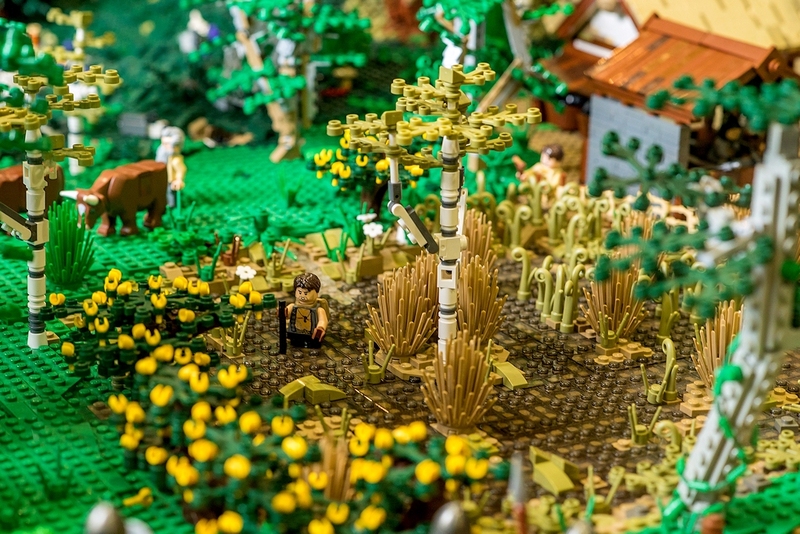 The model is just over 17 square metres in size and reaches over 30 bricks in height. England 793. © Brick to the Past, 2016. As usual a great deal of research went into creating this model, which took the form of extensive reading and no small number of field trips. The model contains a number features based on these efforts and we have tried to incorporate as many iconic Anglo-Saxon sites and features as possible. Of course, this is not a scale model of Lindisfarne as such a thing would be wildly impractical and arguably, not that interesting as it would mostly consist of sand dunes and tidal mudflats, but efforts were made to take certain key features and place them in the model. Perhaps the most obvious of these is the tidal causeway that connects the island to the mainland. This feature was picked up instantly by many of the visitors to our shows and essentially provided the model with all the context it needed. The second is the inclusion of a second small island, complete with hermit in residence. This is based on St. Cuthbert’s Island, which was occupied by the eponymous patron saint of Northumbria in the early 8th century. Of course St. Cuthbert was long dead by the time the Vikings turned up, but since he occupies such an important place in the area’s history, it felt important to include a reference. Attack on the monastery. © Brick to the Past, 2016. Longboats on the monastery beach. © Andrew Whyte, 2016. Our island monastery complete with causeway and marauding Vikings. © Brick to the Past, 2016. The island has the first of a series of fiery beacons that are meant to act as a form of communication from sea to hinterland. These beacons are meant to be a warning of impending danger, but they also act as a means of tying the different sections of the model together. On the southern side of the river, sitting in the mouth of the estuary, is a small Anglo-Saxon fishing village. This section was built by Jimmy Clinch. The village is based on excavations at Hamwic in Hampshire. Perhaps the most prominent parts of this section for the model are the two Viking longboats, one of which has landed at the village, the other still gliding through the breaking surf. 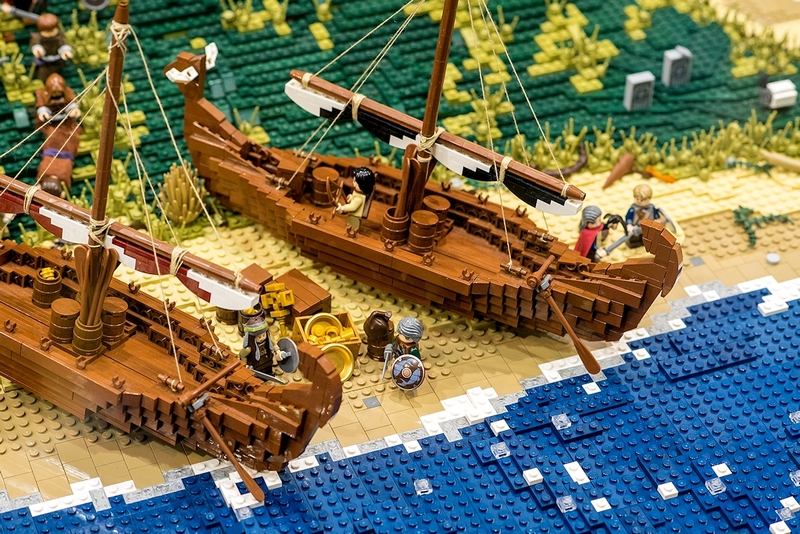 There are in fact four longboats in the model, the other two having landed on the island's southern beach. 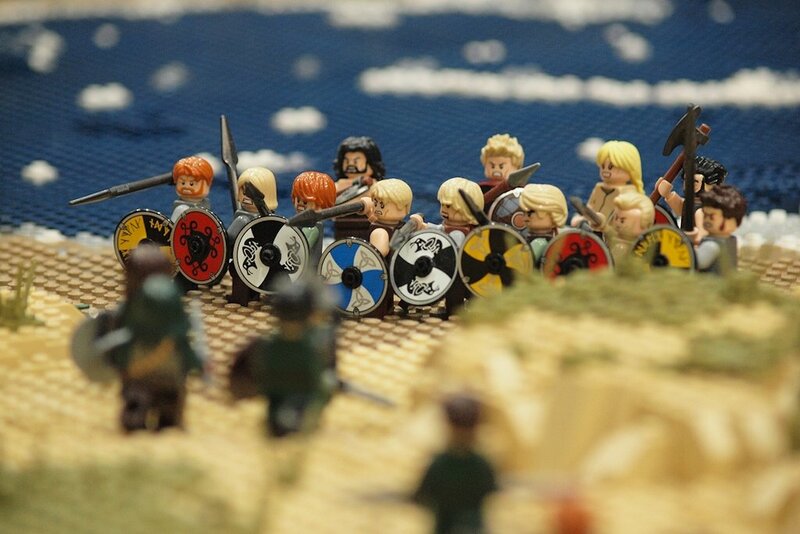 We've tried to tow a line between authenticity and expectation with our Vikings so you won't find any daft ahistorical helmets anywhere on the model. Our shield maidens are however more debatable as there is some doubt over their existence outside of myth and folk-lore. However, we feel their inclusion added an important dimension the model, which might otherwise have been too 'male' orientated. One of the five fiery beacons located on the model. © Andrew Whyte, 2016. Longboat! © Brick to the Past, 2016. Fishing village. © Andrew Whyte, 2016. To the north of the fishing village, on the opposite side of the river, is an area of pasture, woodland and sand dunes, built by Steve Snasdell. This area was kept deliberately free of buildings since we wanted to emphasise the separation of the monastery and the general population. Isolation was a quality the founding monks of Lindisfarne were after when they established themselves on the island, so this space formed a key part of the model. The Vikings prepare for battle! © Paul Shabajee, 2016. Our Anglo-Saxon settlement is based on West Stow. © Andrew Whyte, 2016. The middle section of the model was built by James Pegrum, who was the only builder to take on both sides of the river. James’ section therefore includes an variety of environs, including woodlands, salt marshes and a pretty imposing hill grazed by sheep. On top of this hill is another Anglo-Saxon village, containing a variety of buildings and structures. 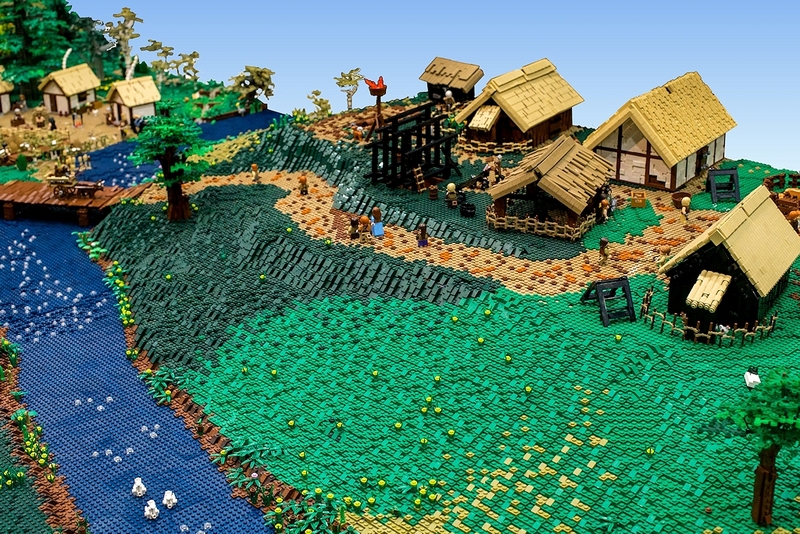 James based this village on a reconstruction at West Stow in Suffolk. 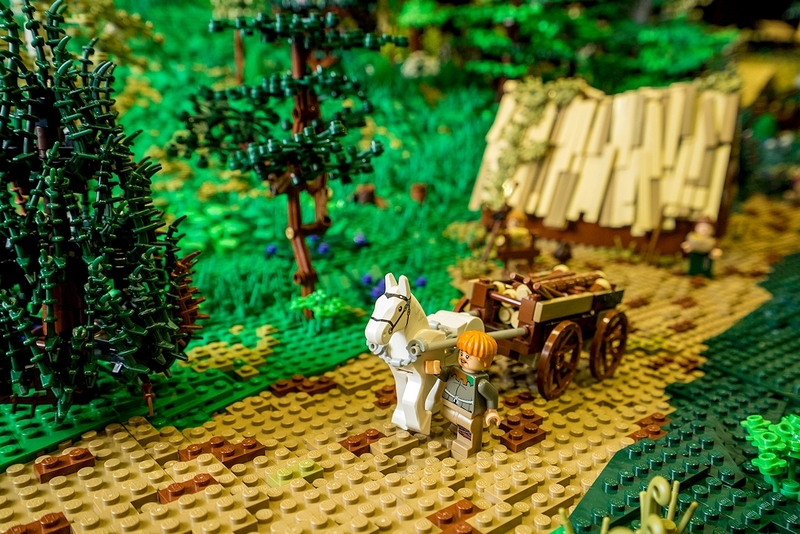 The village contains a number of authentic depictions of Anglo-Saxon life, including the construction of a new building. 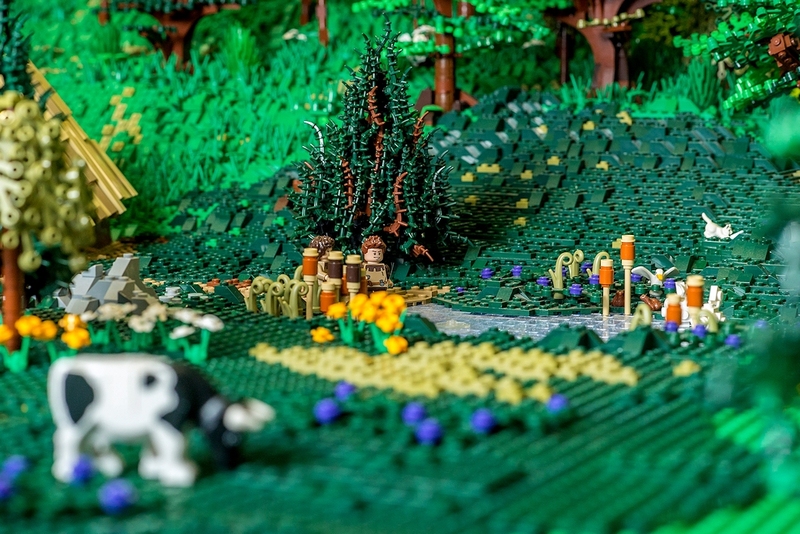 Here you will see some minifigures splitting wood in the authentic style. Another key feature of the model can be found in this section. 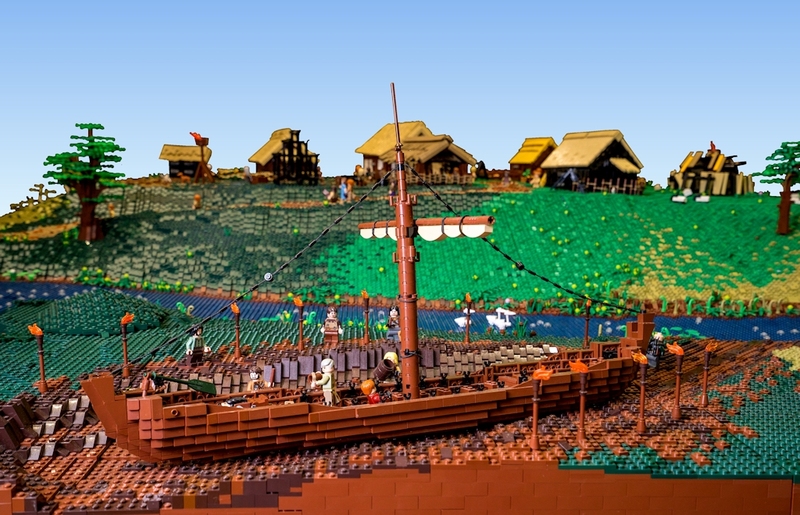 Along the southern side of the river is a ship sunk into a muddy pit surrounded by torches. This is based on the Sutton Hoo burial in East Anglia, which yielded what is perhaps the best known artefact from what we can loosely call the Anglo-Saxon period – the Sutton Hoo Helmet. 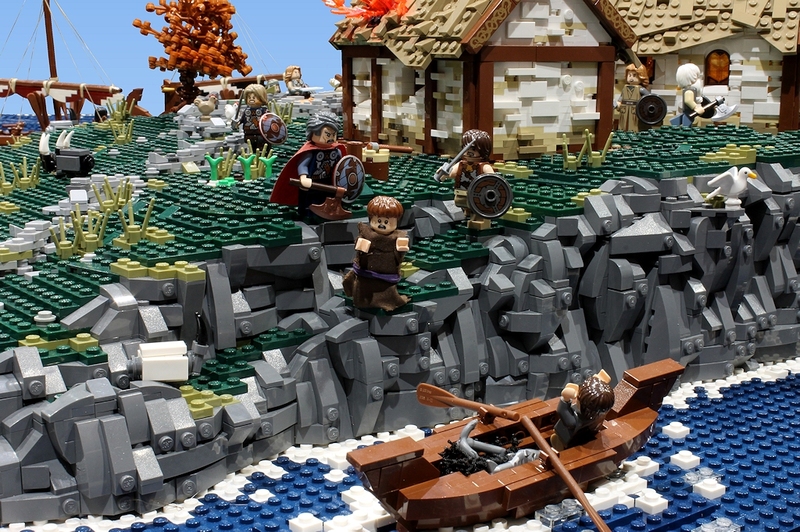 While this burial took place between around 575 to 625 AD, long before the first Viking raids and indeed long before England’s conversion to Christianity, it was felt that due to its cultural significance it could not be left out. The journey up the river is therefore a journey through time, with Christians and Vikings at one end and pagan burials at the other. A ship burial based on Sutton Hoo. © Andrew Whyte, 2016. The final settlement along the river was built by Tim Goddard. Tim has packed this section with little details from the period, perhaps the most interesting being a minifigure searching for bog iron. 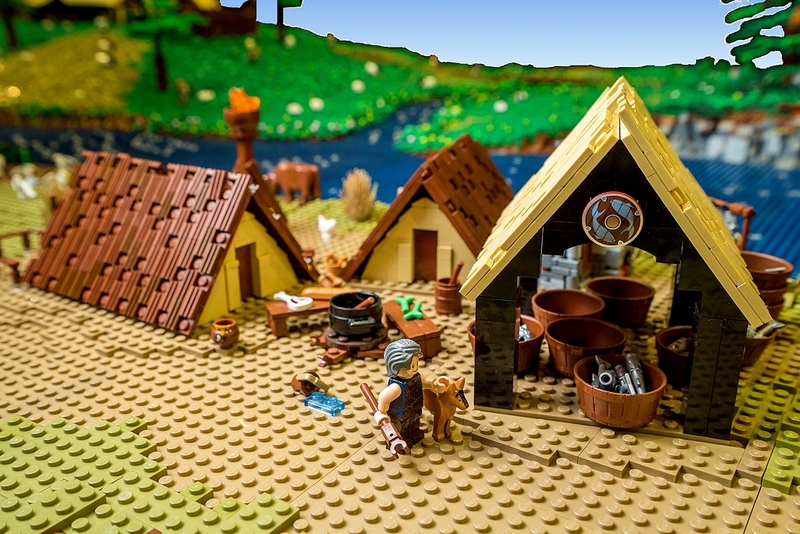 During this period bogs rather than mines were the primary source of iron ore and so with this little touch we hoped to convey a little story about Anglo-Saxon life that distinguished the model from other historic build. Tim packed his section with a variety of amazing trees, both dotted around the village and within the broader landscape. These were the result of extensive research into what trees and shrubs were found in England during this period and Tim has managed to recreate a number of identifiable species including oak, birch and gorse. 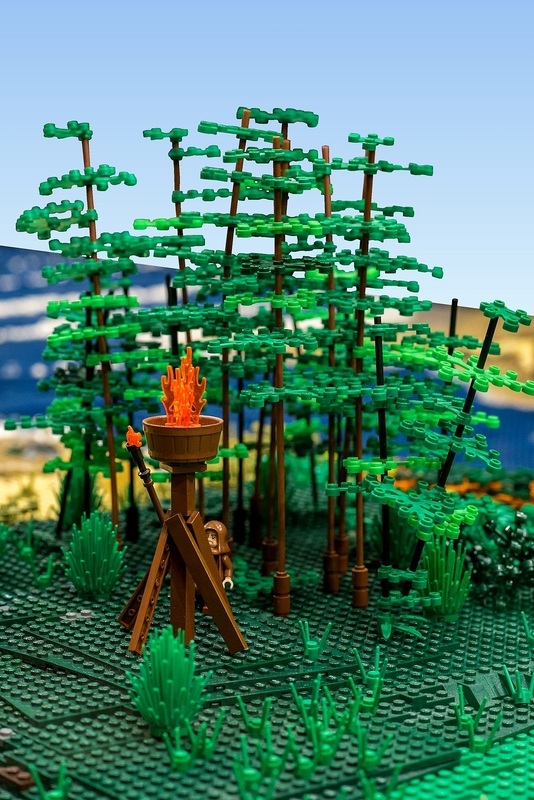 The gorse bushes are particularly innovative, with yellow minifigure hands used as flowers. The western end of the model, which was built by Simon Pickard, becomes much wilder being home to its highest hill and densest forest. In the centre of this forest is a carpenter’s hut, complete with authentic dark age machinery. This section also contains one of the models most surprising features – a vast underground cavern complete with stalagmites and stalactites, subterranean waterfalls and dinosaur skeletons. The feature was designed so that it could only be seen once the viewer was up close to it, inspiring a sense of awe and wonder. 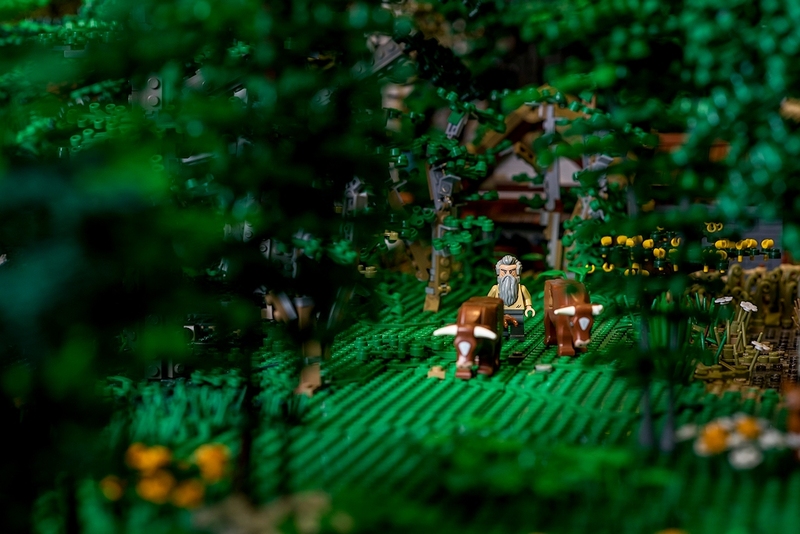 An Anglo-Saxon searches for bog iron. © Andrew Whyte, 2016. Cow herding. © Andrew Whyte, 2016. The carpenter goes about his business. © Andrew Whyte, 2016. Life within the woods. © Andrew Whyte, 2016. The Team; from left to right - Tim Goddard, Jimmy Clinch, Simon Pickard, Dan Harris, James Pegrum and Steve Snasdell. © Andrew Whyte, 2016. Like most of our large models, England 793 only existed as a whole during the year of its creation. However elements of it, such as the island monastery, remain extant and are still available to rent. Contact us for more information.